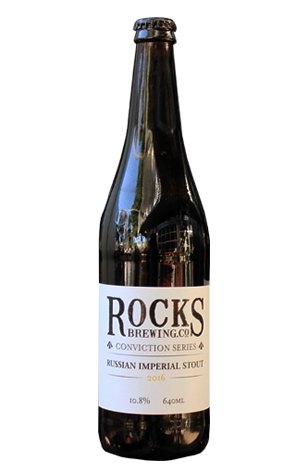 Mark Fethers, the CEO of Rocks Brewing, has been banging on at his brewers for a few years about doing an annual release of Russian imperial stout, with the grand ambition of having a back catalogue of vintages which can then be blended into some sort of master beer made from a portion of each of its younger siblings. With the release of Rocks’ second RIS, he might just be on his way. The first in the series, in 2015, was overseen by head brewer Scotty Morgan and Nick Downs from Reformation Brewing, who happened to be over from Georgia, USA, to help install a bit of brewing kit. This year's vintage is the baby of brewer Matty Cuthbert who, a couple of years ago, had created the template via a trial batch of RIS that went on to be known by the brewers as Ivan the Terrible, due to having been half forgotten about over lunch and boiling itself into a volcanic slurry with a 12.5 percent ABV kick. The 2016 vintage, again brewed by Matt, doesn’t quite reach those same heights, but at 10.8 percent it’s not far off. It’s also very sweet and smooth and rich and velvety and all those lovely things that you want in a big beer that’s meant for supping and sharing. If you’d rather embrace a selfish streak, grab a couple of bottles (this is the first time the RIS has been packaged – and in classic, clean wine style, no less) and squirrel them away until next winter to be enjoyed (hopefully) alongside the 2017 vintage.